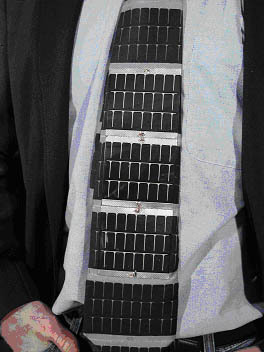 A solar power necktie has been designed by Iowa State researchers. The intent is to charge a 3V lithium ion batter of a type typically found in cell phones. Three Iowa Thin Film MPT3.6-75 solar panels were applied to the front area of tie. These panels are shunted to 3.6V and when connected in series produce approximately ~150mA in full sun. The flexible solar panels were coated with a laminate that protects the solar material. When energized, the solar panels act similar to batteries. For connecting the panel to a circuit, a connection bus made of electrically conductive tape is adhered to the plastic panel. This makes it possible to solder connections. A multi-filar wire, having insulation on each filament, was soldered to the solar panel buses to connect them in parallel to a female plug that was removed from a Nokia cell phone charger. According to researchers, the necktie is not flexible enough to actually tie into knots; they recommend a clip-on tie. "...In every diaper there is a fine copper wire. When that becomes wet a delicate current is sent - you understand I mean an electrical current, not a watery one - to an amplifier and a certain sound is made, and the nurse will properly react to that sound..."
Read more at . APPLICATION OF DIGITAL TEXTILE PRINTING TECHNOLOGY TO INTEGRATE PHOTOVOLTAIC THIN FILM CELLS INTO WEARABLES.